Oh man the VCPs out there are screaming “No!!! You can’t vMotion Local Storage!”. Oh to the contrary my friend, with a wee bit of ingenuity you can do many things. Now before I go any further I will state the obvious. As any VCP will tell you, you can’t vMotion the local host storage. But… but.. You can convert the local storage in to shared storage. This is not supported by VMware so do not expect a lot of tech support but let me lay it out for you. 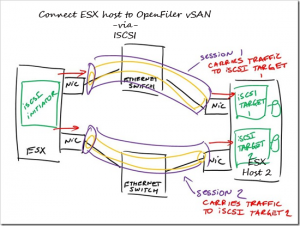 You have several ESX or ESXi hosts running on “Local” storage and have a license in vCenter for the vMotion abilities, but if you don’t want or can’t afford to buy some big ISCSI SANS unit, you will not be able to use your vMotion. The standard Dell Power Vault cost a few pennies and you just don’t have the doe. Here is what you can do. That’s right!! Create a single VM that consumse all your local storage and let it present ISCSI LUNS back to your ESX hosts. We will build our first VM on the ESX host as a virtual SANdevice. The reason we do the first VM as we will be using it’s storage to build the rest of our VMs on. Leveraging the power of open source software and using the google archive of information on how to setup and use the Openfiler SANS OS is imperative. You want to look at Open Filer. It is a simple ISO image you can run from CD or just mount using NFS or from your vCenter client. It installs very easily and can be configured in less than 20 minutes. You would build the first VM with all the storage you have available giving this storage then to the Openfiler system to use for your SANS storage. I will not go in to the install of Openfiler here but if you follow the simple instructions you will have a ISCSI SANS with the total amount of available storage of your host system. You will now have the first host storage shared out as ISCSI and you will connect all hosts via ISCSI to these new LUNs you created in the SANS. See VMware knowledge base for information on how to do this. (It is simple, just outside the scope of this conceptiul article). Now repeat this on all host in your infrastructure. You now have some number of host all with 1 VM installed as a virtual SAN with ISCSI sharing out LUNs to all the host in your infrastructure. You will now in vCenter set the priority boot options to make sure that the SAN VM is the first to boot and has time to come up and get going before any other VMs boot and you can now install VMs on any of the ISCSI LUNs presented to the hosts. Do vMotion, Storage vMotion, HA, DRS and the new FT on any of the VMs. ESX is available to download as a 60 day full eval, so give it and vCenter a try for sixty days while trying this platform layout. You can use VMware workstation to virtualize the whole thing, from the ESX Hosts to the vSAN VM and any VMs after that. 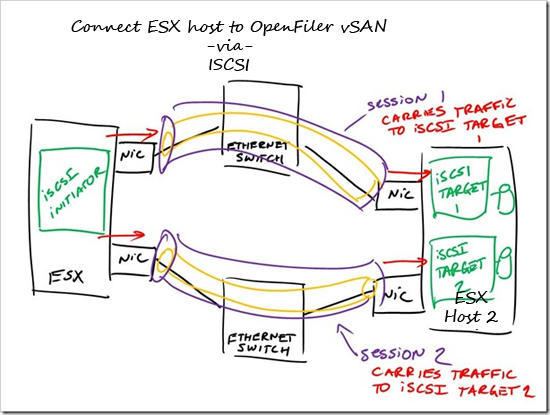 That is also correct… You can virtualize ESX hosts now and then run VMs on those ESX VMs. Is that not just the bomb! I can create and test different ESX deployments inside a VM group inside of VMware workstation. Build and test complex layouts with out bringing your production environments in to the picture. Now that I have your mind turning and thinking of all the posibilities, get out and VM something! Thanks for this article. That’s exactly what I was planing to try. It’s good for the lab but do you think this configuration could be extended in a production environement ? That could make a 2 hosts High Availability cluster for a decent price. Personally, I would tell my bean counters to pony up the doe for a good SANS but when your in the discount bin at Walmart digging around for computer tridbits then you work with what you got. I would suggest that you have the VMs on each host use the local SANS on that host so you limit the ISCSI network traffic across your switches and only use the Vmotion for failover HA and maintenance mode work. You will get the most out of the setup that way and if for some reason you have a host reboot all VM on host come up on that host with out affecting the other host aswell. I’ll post back when I’ll get a smoothly running system.